SCVHistory.com LW2967 | Agua Dulce | $1,000 in Las Vegas Loot, Callahan's Old West, ~1960s. 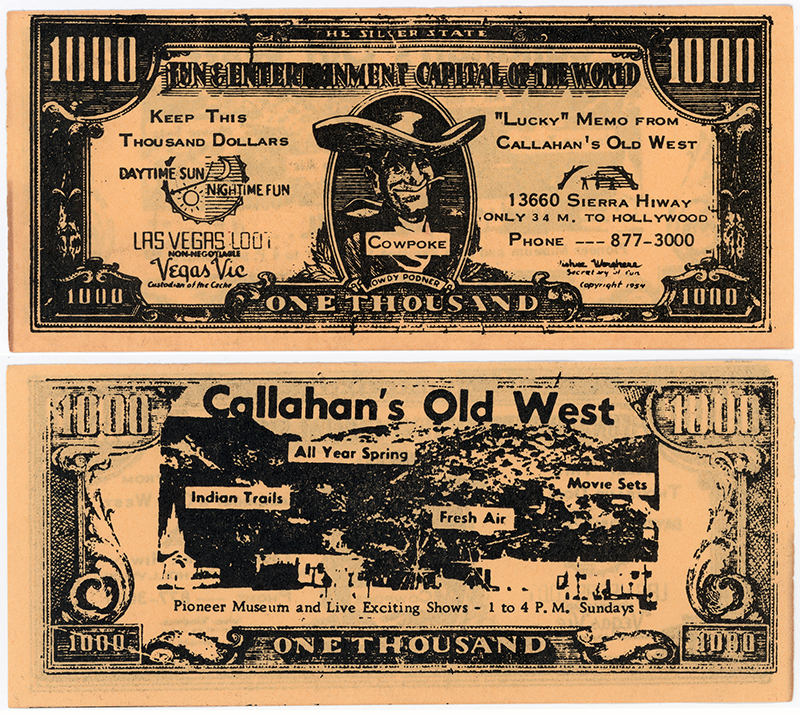 $1,000 in Las Vegas Loot from Callahan's Old West, 13660 Sierra Highway. Probably 1960s; copyright date is 1954. Approx. 2½x6 inches. Good for daytime sun and nighttime fun. Back advertises "Pioneer museum and live exciting shows, 1 to 4 p.m. Sundays." Robert E. Callahan's Old West Trading Post, aka Indian Village, at 13660 Sierra Highway in "Outlaw Canyon" was the equivalent of an amusement park of its day. Callahan (b. Oct. 27, 1892; d. Jan. 10, 1981), an entertainer and novelist, exploited America's fascination with all things Western — especially the romanticized notions of Old California as presented by Helen Hunt Jackson in her seminal 1884 novel, "Ramona" — by collecting objects with a connection, real or imagined, to the novelist and her work, and enticing the public to experience them. Callahan's initial visions of creating an amusement park to be called Ramona Village morphed into the Mission Village Auto Court, which he opened in 1926 at 5675 W. Washington Blvd. in Culver City. Along with a themed hotel, he erected teepees for travelers and put his collections on display, including a chapel, little red schoolhouse and kiva (a small sweat lodge). Auto parks were big business as the automobile came into age in the 1920s. There were a few auto parks in the Santa Clarita Valley, most notably McIntyre's camp at Castaic Junction, which was wiped out in the 1928 St. Francis Dam disaster. In time, L.A. city builders had a different vision for Callahan's Culver City property. By the early 1960s, Mission Village stood in the way of the coming I-10 Santa Monica Freeway. So in 1962 Callahan closed Mission Village and moved it to 13660 Sierra Highway. (The freeway was completed in 1965). Note: In Callahan's day, that part of Sierra Highway was known as Saugus. The county of Los Angeles later included it within the Acton-Agua Dulce Town Council's sphere of influence. It is commonly considered part of Agua Dulce today. In 1987, Callahan's widow, Marion, donated several artifacts from the former Indian Village — including the Ramona Chapel and little red schoolhouse — to the Santa Clarita Valley Historical Society. The main building remained on the property, and from From 1986-2000, Marion Callahan leased it to the Canyon Theatre Guild. In 2000 the CTG moved back to downtown Newhall where the community theatre had started. LW2967: 9600 dpi jpeg from original item purchased 2017 by Leon Worden.